Contents: Short tales often embodying a moral or lesson, the Fables attributed to Aesop often feature talking animals who display all the foibles and shortcomings of humans. Legend insists that Aesop was a slave who won his freedom by his clever advice and stories. The collection I read for this project (0330245333) was first published in 1912, and is charmingly illustrated with line drawings and colour plates by Arthur Rackham. 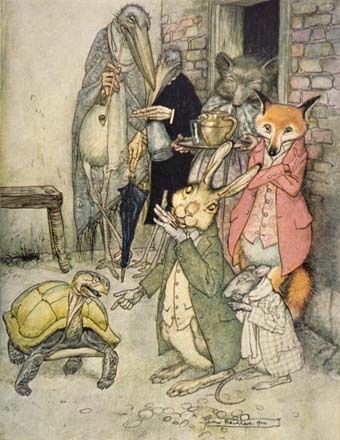 Favourite lines/passages: Many of the fables are very clever and yet very brief. My favourites include the well known ones listed above of course, but also the donkey who thinks if he acts like a small dog and jumps all over his master, he will be rewarded (not likely!) ; the Wind and the Sun competing to part a man from his coat ; and the Mouse who repays the Lion for sparing his life by later gnawing through the ropes binding him. Diversions/digressions: I must admit that I didn’t get diverted by the content of the fables, but diverted away from them as there were over 300 in this book, and with each barely a paragraph, it is difficult to get a head of steam up for the job and read many of them in one sitting. Reading these is probably best done in small doses between other tasks. Previous Oh no! What have I done?